One cannot, like the modernizing reformers, overlook the accumulated wisdom, piety and sanctifying properties of the old rite with its many centuries of hallowed use. Nor can one fail to take into account that, just as in an orchestra, all its constituent parts had a definite and logical relationship not only to every other part, but also to the main structure. So, disturbing even one element is bound to disturb the internal balance and harmony of the whole. We must also consider the wider impact of such changes on the Church itself which, before the 1956 reforms, had always appeared as a cohesive organization with an exact correspondence between the lex orandi and lex credendi. 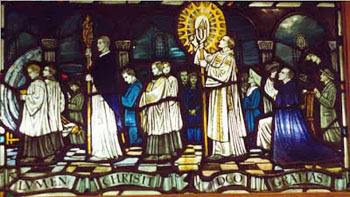 No Pope before Pius XII had ever removed parts of the liturgy pertaining to Catholic Faith and Morals, as he allowed Fr. Bugnini to do (see Part 56), so that the disbeliever would not feel “uncomfortable” – as if truth and virtue were understood to be relative to time, place or culture. As we shall see, the progressivist reformers under Bugnini’s directorship radically re-orchestrated the Easter Vigil in 1956. However, the only similarity between Bugnini and a conductor was that both could make things happen with the wave of a hand. Judging by the results he produced, which are set out below, we will be justified in concluding that he and his Commission, to put it charitably, must not have had an ear for music. Soon, the orchestra would be playing discordant notes out of harmony with Tradition, under the baton of a leader who was, to all intents and purposes, tone deaf. 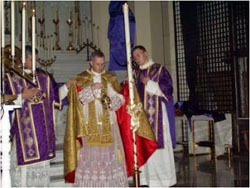 The centennial custom in the Roman Rite was to bless five grains of incense – to be later inserted into the Paschal Candle – with the ancient prayer Veniat quaesumus and the antiphon Asperges me, Domine said by the priest. The Church had given this ceremony greater prominence in the Middle Ages when the art of allegorical exegesis was at its height. As the five grains of incense represent symbolically the five wounds of Christ, they were considered worthy of a solemn blessing before being inserted into the Paschal Candle whose pure, white wax was also a symbol of Christ’s virginal Body. What actually happened to the solemn blessing of the five grains incense at the Easter Vigil as a result of this pseudo-controversy constitutes another sad chapter in the 1956 reform. The accompanying prayer Veniat was not axed. But, as we shall see, the reformers used that other Procrustean operation of stretching and skewing to make it fit a different context. This left the incense grains without any ceremonial prayer for their blessing, also making the Asperges antiphon redundant. Furthermore, according to the 1962 rubrics, even the blessing itself could be dispensed with in the rite, (3) thus providing a further opportunity to reduce the solemnity of what St. Augustine called the “Vigil of all vigils”. Fr. Bugnini, it seems, was a past master at the old game of thimble-rig (4) in which the rapid sleight-of-hand deceives the eye. By means of abstraction, substitution and transposition he managed to radically reconstruct the entire Easter Vigil while making it difficult to keep one’s eye, as it were, on the ball. First, Bugnini uprooted the Veniat prayer from its connection with the incense. By a process of shell-shuffling, his confederates on the Commission whisked it away to be redeployed for the blessing of the Paschal Candle, having first changed its wording (5) to fit its newfound purpose. If we think this move was trivial and inconsequential, unworthy of prolonged attention we are much deceived by the operator of the scam. As in all shell games, there is more in the move than meets the eye. It raises the question: where does that leave the Exsultet, the magnificent hymn that the Church had been using since at least the 7th century as the framework for blessing the Paschal Candle? Its function was recorded in ancient Sacramentaries as the Benedictio Cerei (Blessing of the Candle), and was faithfully handed on to us over the centuries until the 1956 reform. That, however, was before the “shells” were shuffled again by Bugnini, and the Exsultet suddenly lost its traditional function; it found itself changed from a rite of blessing and consecration of the Paschal Candle to simply a hymn of praise. This was hardly an innocent or inconsequential transposition, given the succession of changes that logically ensued and which, therefore, must have been intended. For, if the Exsultet has lost its raison d’être in the blessing of the Candle, the ceremonial procession leading to that climactic event also loses its theological significance. In the next section, we will look at the “Memo” to examine the specious reasoning behind these changes. It will, then, become painfully obvious that when Bugnini and the Commission had finished rearranging the “shells,” some ancient ceremonies were discontinued, having been absorbed and replaced by innovations and different liturgical forms, and some doctrinal content had simply disappeared. 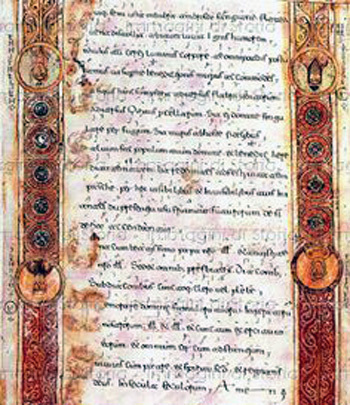 A version of this prayer is found in the Old Gelasian Sacramentary of the 8th century. It was only one of several used in the Church at that time for the blessing of the Paschal Candle before the Roman Missal was compiled. The priest could bypass this part of the rite if the incense grains had already been blessed before the Vigil, i.e., he blesses them only “si non sunt benedicta” (if they are not blessed) and in silence (“nihil dicens”). 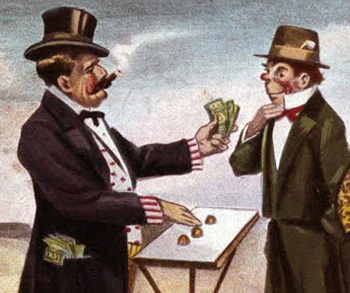 Equivalent of the modern shell game, it has been part of the con artist’s repertoire at fairs and racecourses since ancient Greek and Roman times. The word cereum (candle) was added.